Hey, everyone. Wayne Smith here again, though Kevin is recovering nicely. In fact, he makes a guest appearance elsewhere in this Update. Otherwise, we’re doing final prep for Anime North and continuing to work on a number of projects and upcoming releases. As I write this, Pinnacle Entertainment Group’s Rifts® for Savage Worlds Kickstarter is 5,000% funded and still going strong! It offers books in print and PDF, a Game Master screen, maps, dice, bennies, a messenger bag, and a T-shirt, among other items. Reward levels range from the $15 Digital Player to the $240 Everything GM. Savage Worlds players can take advantage of the current Rifts® Savage Sale to learn more about Rifts Earth right now, and can also grab some PDF Rifts® books from DriveThruRPG.com. Blend Palladium’s Rifts® source material with Savage Worlds®, and vice versa for Palladium’s Rifts® gamers. You may want these full color, well written Rifts® Savage Worlds titles just to read and own, but there are plenty of cool ideas, random tables and adventures you can easily incorporate in your current Rifts® games. Many stretch goals have already been unlocked, including adventures, pre-generated archetype characters, D-Bee races to play, additional gear and weaponry, and an expanded Player’s Guide! To celebrate the success of the kickstarter, and because you folks liked it so much (and because Kevin still isn’t around to stop me), we’ve decided to bring back the Rifts® Savage Sale for one more week or so – till midnight on Sunday, May 22. Get some great books at a significant discount before time runs out. Whether you are looking to fill in holes in your collection or thinking about trying Rifts®, this offering gives you the core books to dive right in. 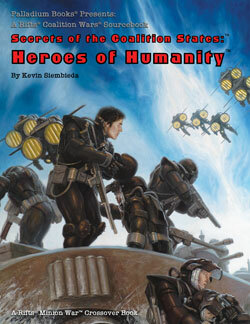 Many are titles you are likely to want for campaigns involving Rifts® Heroes of Humanity™ and the Minion War™, like Rifts® Megaverse® in Flames™, The Vanguard™ sourcebook, Rifts® Book of Magic, Coalition War Campaign™, Rifts® Sourcebook One, and Siege on Tolkeen™ 6: Final Siege™, among others. 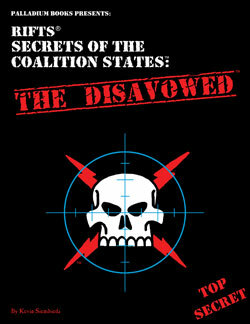 Rifts® Coalition States: Heroes of Humanity™ is going to change the way you look at Rifts® campaigns. Discovering Rifts® for the first time? Any of these titles will help you get started fast. Enjoy and game on! Kevin Siembieda – partial cyborg?! This is the first thing I have written since I was struck by a jeep on Mother’s Day, May 8, 2016. The driver was backing out of his driveway and didn’t see me. Knocked me to the concrete sidewalk and broke my humerus (the bone between the elbow and the shoulder) right in half. My right arm, of course. I never imagined getting hit by a car walking on the sidewalk where pedestrians belong. Sheesh. It was pretty scary and surreal to have my arm just dangling, unresponsive, like the arm of a puppet. And the pain ... it was something else. Getting X-rays was torture. Long story short, I have a couple of eight inch long braces and screws holding the bone of my right arm together. Artist Nick Bradshaw teased me that I was now man and machine. Cue the Terminator music. A couple other people asked what it was about writers and getting struck by vehicles while walking; referencing Stephen King getting hit on the side of the road some years ago. Thankfully, my injuries are nowhere as severe as Mr. King’s. I'm home, on the mend and more mobile every day, but still feeling pretty rough around the edges. I hope to get back to work very soon. I have books to finish writing and I’m more motivated than ever. It would appear someone “up there” is watching out for me. Doctors, nurses and everyone have commented that as severe as the break is, my injuries could have been much, much worse: head or spinal injury, multiple broke bones and injuries, even crushed limbs or death(!) had the car kept going. Scary stuff, for sure. The fear that haunted me was the possibility of losing the use of my right (dominant) hand. I think losing the use of your hands to write and draw is a fear of every artist and writer. The radial nerve wraps around the bone of the upper arm, so there was a genuine possibility that in repairing the bone, I could suffer temporary or permanent damage to the nerve, impairing movement in my right hand. I was a nervous wreck until after surgery as I waited for all sensation and movement to return to the fingers of my hand. What a relief when they did. Whew. They say your life passes before your eyes in a life and death situation. In my case, it was the many unfinished books, projects and obligations I am currently working on – and freakin’ Anime North! At the time of the accident, Anime North was only two and a half weeks away! All I could think about was all the people I would be letting down if I could not attend. And how was I going to sign books for fans or run games, and do a lot of other things?! I had agreed to Anime North a year ago and had been hyping it for months. I had to be there! And I need to bang out the many books I’m working on! It was all so very frustrating. I wanted to cry, scream and kick something all at the same time. Instead, I tried to stay calm, positive and hope for the best. Anime North, here I come! Even if I have to dodge and wrestle with cars to get there. The good news is I am bolted back together and my doctor is allowing me to attend Anime North with the promise that I do not overdo it, I wear my sling and I’m very careful. What about you? I hope a bunch of our Canadian fans will be there to enjoy Chuck Walton’s and my panel talks, chat with me and meet several other Palladium creators, get autographs, enjoy games and demos, and have a great time. In addition to myself, Chuck Walton, and Wayne Smith, Gregg Diaczyk (writer), Braden Campbell (writer), Brett Caron (writer), Apollo Okamura (artist), and other Palladium stalwarts will be present to run games and demos, and chat all weekend long. My injury is such that I can even sign autographs! Woo hoo! I will have to wait and see if I have the energy to run gaming events, but I’m still planning to do so. 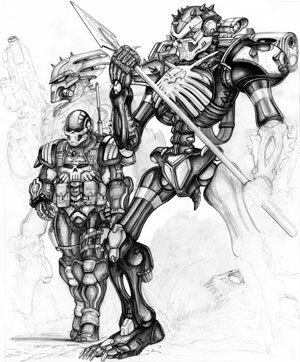 Look for the Palladium Books booth in the gaming area. My sincere thanks and appreciation for the many well wishes for a quick recovery. I’m working on it. A special thanks to Ted C. and Ned L. for the thoughtful get-well cards. It was a pleasant and welcomed surprise. 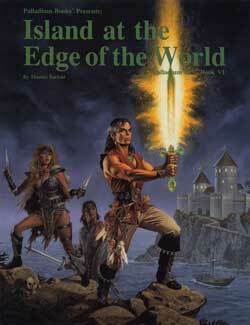 And how about that Rifts® Savage Worlds Kickstarter? Amazing. 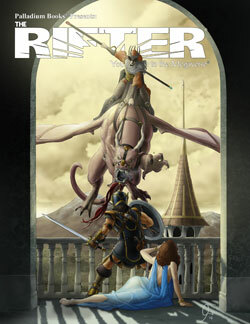 I am so glad for the folks at Pinnacle and happy to see the Rifts® Megaverse® continuing to expand. With any luck, you will be seeing many more exciting Rifts® and other releases coming from both Palladium Books and other licensees. Thanks to everyone for your well wishes for Kevin. And a huge thank you to all the backers who have made Pinnacle’s Savage Rifts® Kickstarter such a tremendous success. We had faith it could do that well, and you all really did us proud.